This is a boring post with no pictures a quick brain dump to provide some more detail on some of the ideas for possible monthly painting themes for the Middlehammer facebook group. I'm mostly putting this out there to get a conversation going and see which if any of the ideas below have the most interest behind them, so not saying this is or has to be the schedule - and very interested to hear any ideas, comments and suggestions people have about themes or competitions they already know about and think we could link up with, or new ones they would like to see happen. April Fools! - this was a really fun one and anything and everything that you think links to the idea of April Fools is fair game! Last year I painted up a Goblin Doom Diver which seemed to be the perfect choice, but I was also tempted by a number of Bloodbowl nutters, jesters, mad mages, and other comedy characters from various games and ranges. The world is your lobster! Mayday! Mayday! - pick up a project that needs rescuing, either because of mistreatment by a previous owner, damage in storage or transit, or just having been sidelined for too long and now being covered in dust and cobwebs. Last year I finished off a unit of Goblin Wolf Riders that forced me to try my hand at press moulding for the first time. This theme was practical, productive, challenging (for me at least! ), and most of all, fun! Scenery September - another very practical painting/modelling theme! Everyone needs scenery to get the most out of all the hard work we put in on our minis and armies, and how many of us have a stash of interestingly shaped bits of cardboard and polystyrene in the shed? Well if you need a bit of a push to turn that junk into a scratch built masterpiece (or not!) then this is the theme for you! Sporting Summer??? - The summer months seem to warrant a more leisurely pace and something which stretches over June-July-August seems wise. Da Big Mek of Middlehammer Township, Mark Evans, last year suggested a nice idea which was to paint up a 'team' of any kind you fancied. 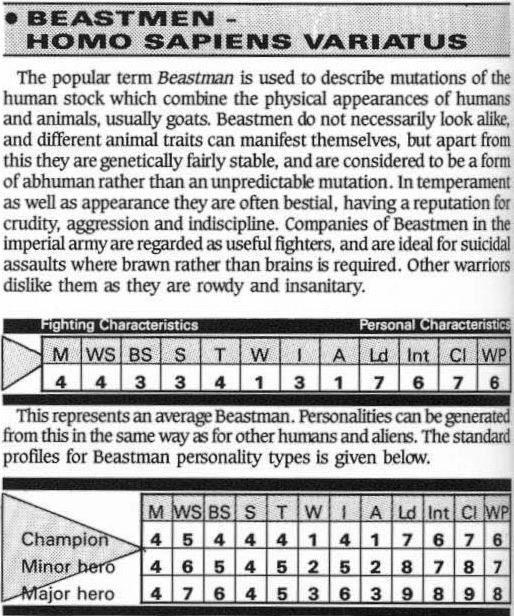 It tied in nicely with all the on line scuttlebutt around the Bloodbowl Reboot that was 'kicking' around at the time (Sorry!/Not sorry! ), but a team was also interpreted to mean a gun crew, support staff, vehicle crew etc. I played around with the idea of a Warhammer version of the Royal Navy Field Gun Races, and might still go for a diorama of that one day (once my hobby skills catch up with my hobby daydreams that is!) Imagine teams of Orcs, Dwarfs, Brets and Empire gun crews going up against each other! Vermember?? ?- This happened in 2015 I think. I may have dreamt it. The obvious culprit, Snickit, of the excellent Snickit's Tail, swears it wasn't him. 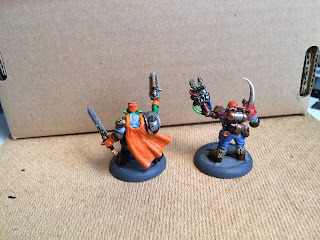 Last year I had my own mini Vermember celebration, and there was a little bit of extra ratty goodness going on at that time of year in the wider Oldhammer/Middlehammer community, but it wasn't a real theme or competition like the others. Maybe we should change that? First Miniatures Month - January seems the perfect time to revisit what first got you into the hobby and the idea of First Miniatures Month seemed to really speak to the community last year and I remember a number of good blog posts at the time. I know we don't need an excuse to revisit our first loves in the hobby, but it is always nice to have one! 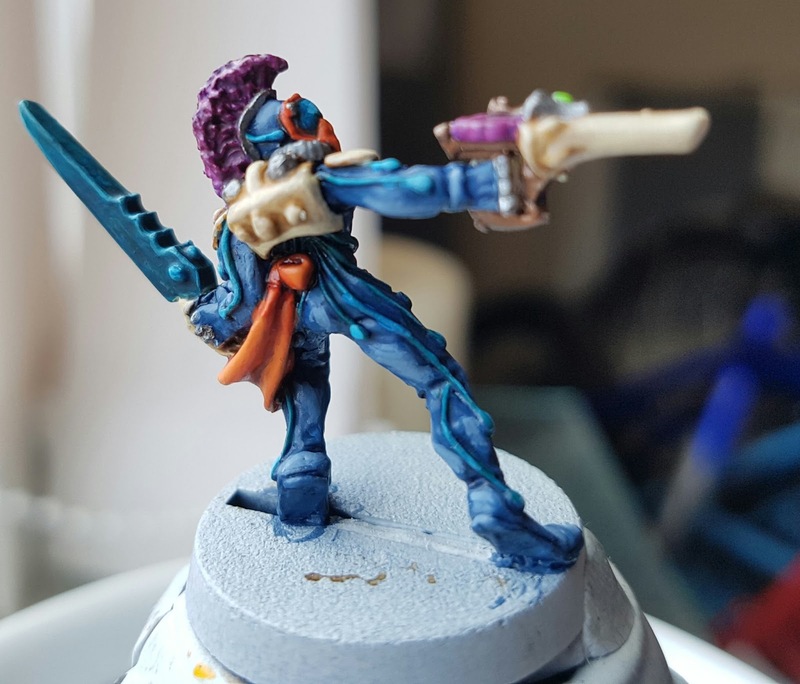 Your Painting Theme/Competion Hobby Project Here! - I'm sure there are far more, and far better, and far more better, ideas for painting themes out there. Please get in touch via the comments, or by dropping me a line on facebook, feedback on what themes would be popular among the community is key! 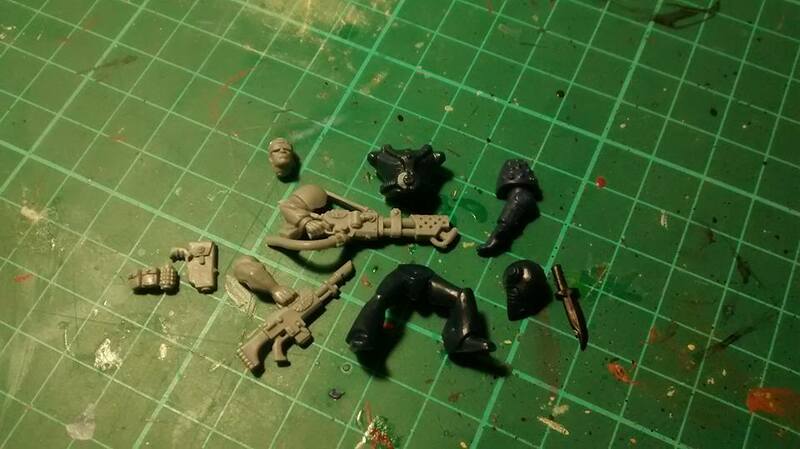 Well things are definitely progressing, the first of the Strikeforce minis have reached me from farthest flung northern Europe, and we've had more updates from David and AVP Shaun on their entires. I can't wait to see all these guys together and get them set up for a group shot! Thanks again go to Pete Grange for helping out with this and bouncing some ideas around! 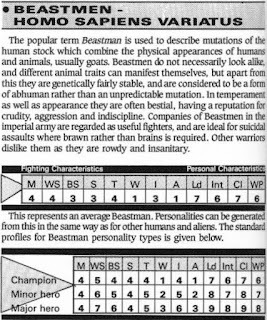 The standard Warhammer 40,000: Rogue Trader stat line will be largely familar even to players of later editions of 40K, all of the familiar elements are there, the major difference being the additional range of 'mental' stats reflecting the more Roleplaying Skirmish Game nature of RT compared to later 40K. In addition to the familar Leadership (Ld) score, we also have Intelligence (Int), Cool (Cl), and Will Power (WP). Now, tweaking to suit background and to make these glory hunting psycopaths stand out from the crowd is encouraged, and I think people should go with what best suits their idea rather than being bound too much by 'rules', but do remember stats can go down as well as up! Thanks for stopping by, and stay tuned for more updates on the motely crew that make up the Middlehammer Legacy Strikeforce! 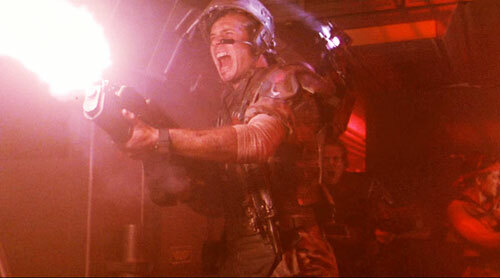 RIP Bill Paxton (May 17, 1955 – February 25, 2017) - "Game over man. Game over." Hello all, and apologies yet again for the delayed updates on the Middlehammer Legacy Strikeforce Project. Anyway! After some chat on the Middlehammer fb group, and continued illness of myself and a couple of other participants the deadline has now been extended right up until the end of March, with entries to be with me by first week of April, and the draw for the lucky winner taking place in second week of April. 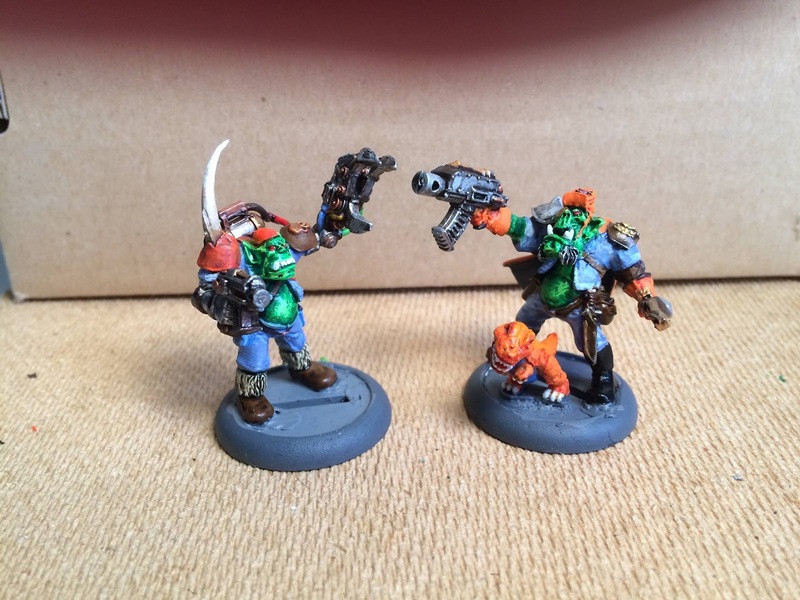 I've had another few updates from participants since the last post, so in additon to my human merc, Pete Grange's striking Eldar, we now have Mikael Igge Holmberg's bruising Ork brothers and their pet Snapasaurus (not the official biological name - it is possibly some form of previoulsy unidentified Squig!) 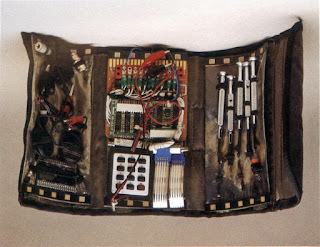 - and we've seen grainy black and white security cam footage of a group of Muties, and a Mohawked Merc with a Tommygun! I've also heard rumours of a couple of Squat ex-guilders on their way to join the group! Big thanks to everyone for their efforts so far - it has been great to recieve your updates and encouragement! Here are some snaps of Igge's Orks to go with the pics of Pete's Eldar from my last post. Igge informs me the min-T-Rex is an old orky extra bit from the Foundry - I love it! These two are great - there's something about the bright orange hat that reminds me of Jayne from Firefly! 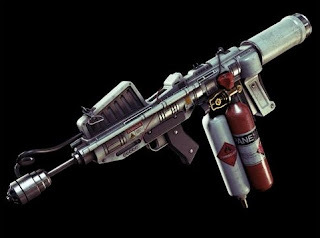 So I was looking for some inspiration for my Human Merc with Flamethrower, and I was starting to lean towards the 80s Stadium Rock idea. Then something sad happened. Bill Paxton, an actor who appeared in many of my favourite movies growing up, had passed away aged just 61! Private, 1st Class, William Hudson: "Stop your grinnin' and drop your linnen!" Suddenly it all clicked into place. For those who don't know Paxton played one of the most iconic characters in the movie Aliens - Hudson the cynical Colonial Marine squad leader. 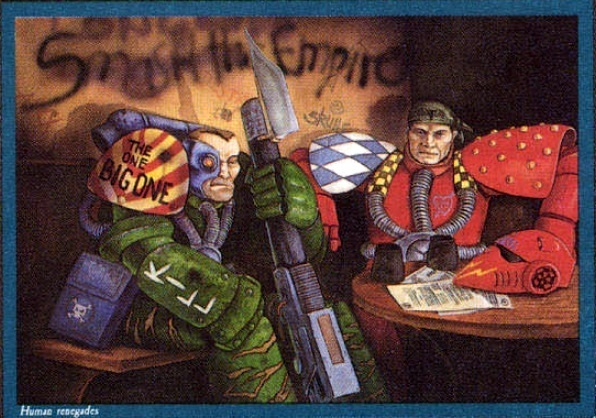 The work of HR Geiger is well known to have been an influence on the development and some of the imagery behind Warhammer 40,000: Rogue Trader; the Colonial Marines from Aliens definitely had a touch of the snark about them like the human renegades from the banner picture; and it would be an homage to Bill Paxton and the character of Hudson. 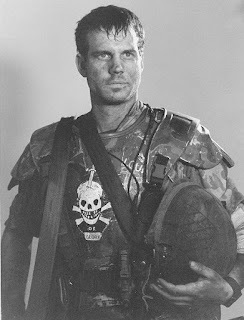 I give you Hudd Paxton: Human Mercenary. Not the best lighting I'm afraid, not showing the blue tint on the glasses, or the rust and corrosion on the flamer as clearly as I'd like. He's still not 100% finished, but I've done enough for a meaningful update, and he is back on course to be finished before the deadline at least! I've had a bit of trouble getting an orange I was happy with, but also had some depth to it, but washes of plasma red and chestnut inks have helped, as have highlights of mixed Troll Slayer Orange and old school Sunburst Yellow. Still some more detail to do on the bag straps, and I'd like to add some detail echoing the graffiti on Hudson's chest plate on the Orange Shoulder pad, but that might prove a stpe too far, so we will see how it goes. 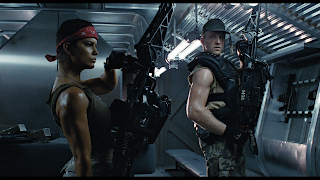 The bandana is not a Hudson trade mark, but it does tie in nicely with some other Aliens characters, as does the oversized Flamethrower, both of which remind me of the Smart Gunners, Vazquez and Drake. Colonial Marines Vasquez and Drake armed with Smart Guns - the psycho sexual interplay between these two characters is an under appreciated element of the film imho. It was the flame thrower that was giving me most grief though. I really didn't want to go for the classic dirty gun metal look, and had been trying to use non-metallic paints for metals, but once I thought about the flamethrower from the original Alien movie it again all clicked into place. The dirty industrial plastic look and rusted metal was perfect, so I set out recreating it as faithfully as I could. 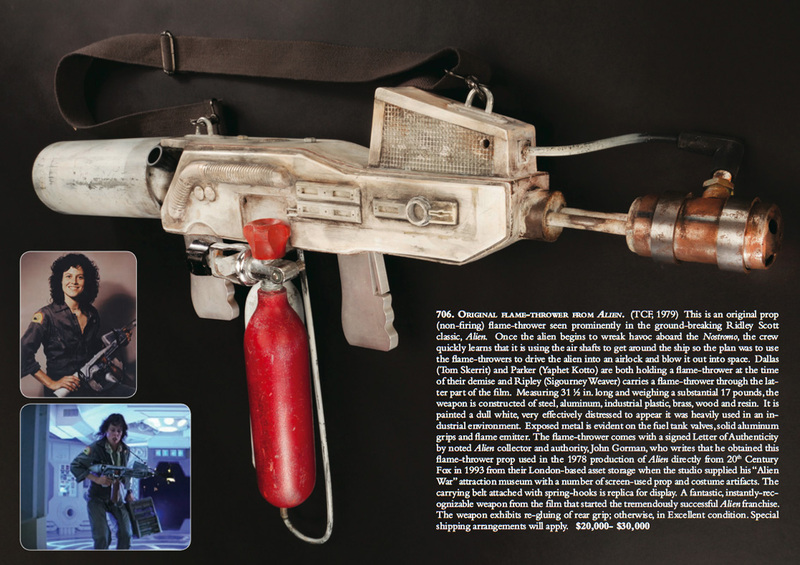 Here you can see the original movie prop in detail. Image from the AVP Wiki. Here you can see a less knackered version of a later model (from one of the Aliens computer games I believe), but it doesn't have the same character for my money. The gas canisters (made from a pair of Cadian IG binoculars) have been painted red and white, but I'm probably not going to add any warning signs for fear of making the model too busy. A later evolution of the same model flame thrower as seen on the AVP Wiki. 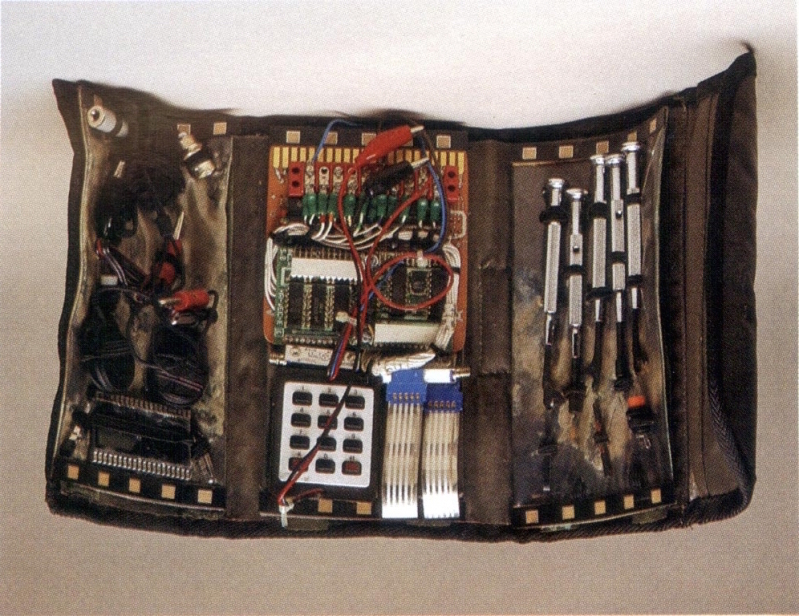 Oh, and if anyone is wondering what Hudd Paxton keeps in his webbing, this is a good example - a picture of Hudson's technical kit from the Aliens Movie - image, as per all of the Alien/Aliens movie images in this post, taken from the AVP Wiki. Hudson was the combat technician for his squad, and I like how this emphaises the different roles that marines have to play in combat - much the same reason I choose to include the comms style back pack on my human merc. Anyway - apologies again for the lack of regular updates, but hope you enjoy seeing progress so far! This has meant an absence of any updates on the Middlehammer Legacy Strikeforce project, or any progress on my entry! 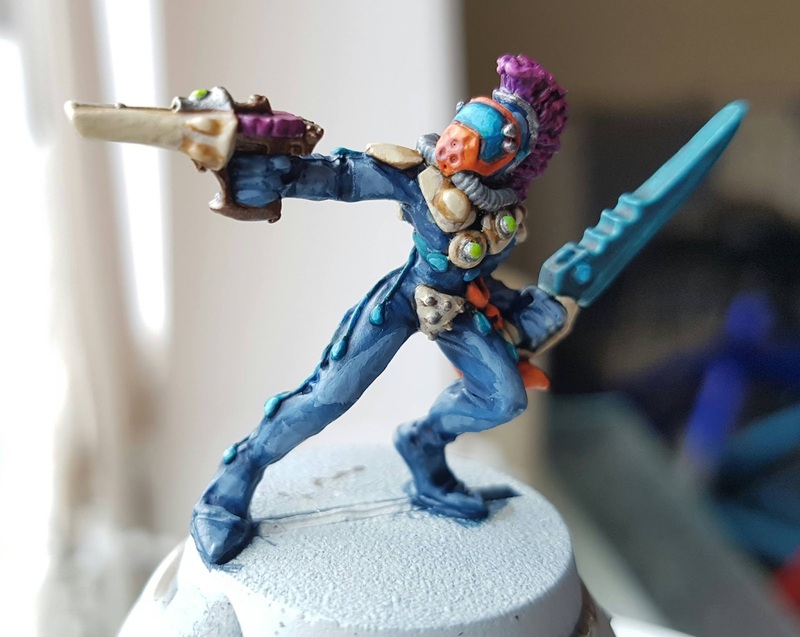 Apologies to those who are taking part, and many thanks to Pete Grange for the nudge with the very striking Eldar Mercenary he is entering - WIP pics looking very good! Rear shot showcasing more of the wraithbone armour, which I love with this colour scheme! 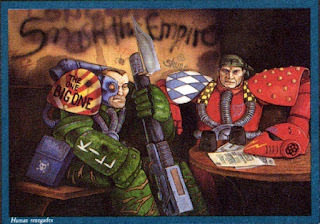 Anyway, I've taken the inspiration for my entry from the iconic image of the two Human Renegades from p.172 of the Rogue Trader rule book. 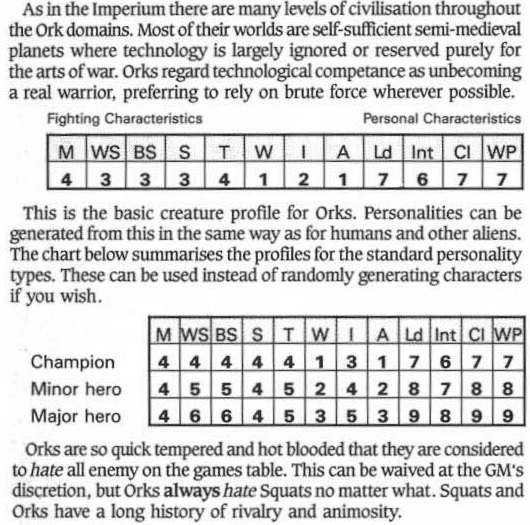 I had a few ideas in mind, but this was the one I could most strongly visualise and I had a promising selection of Oldhammer/Middlehammer bits to work with that would fit the theme perfectly. I'm still to decide on a name for him. It's either going to be something from 80s Stadium Rock, or an homage to the Alien Films. Not sure yet. He is deliberately holding his flamethrower like an Ax, and by Ax I obviously mean an Electric Guitar. I adjusted the angle of the head slightly to show off his earing, and I like to think this gave him a little bit more rock star attitude. I tried scarring up the very clean and shiny shoulder pad a bit too. 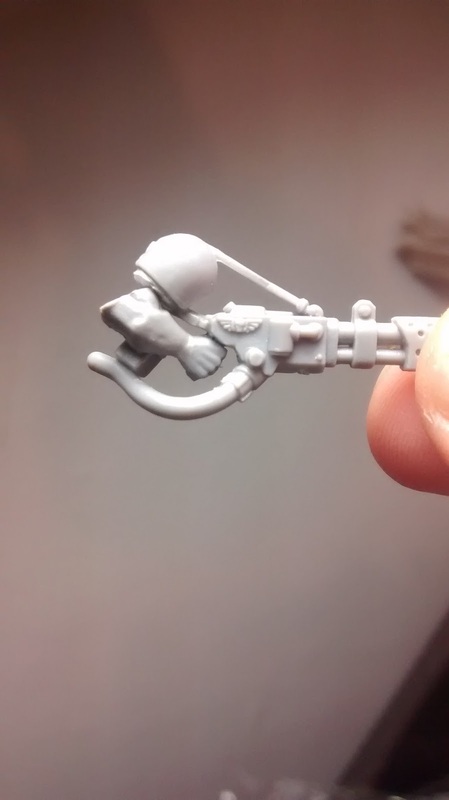 I'm still far from 100% happy with it but the original Cadian flamer arm was just too scrawny. It needed the beefcake upgrade from a Catachan. Surgery was required! I hated doing the green stuff on his arm. A slightly misjudged first cut meant more *ahem* 'scultpting' than I had hoped for. Even after getting it to a point that did not look too awful there was something jarring to the eye. I could not figure out what was wrong with it. Then it hit me - He had two elbows! The angle of the arm I've used is completely different to how it has ended up, so the original elbow now appeared to be sticking out like a weird bony protrusion above his wrist. This was the route of the problem, the angle of the arm was all wrong really, even if it did have the Arnold Scwarzeneger look I was after. UPDATE - I was so far from happy with this massive glob of greenstuff and extraneous elbows that I cut it out and started again, also removing a piece of detail (a webbing pack I think) from the inside of the piece, which appeared to be floating in the original build and can still be seen in the pictures here. It's better, but still hideously amateurish. But! 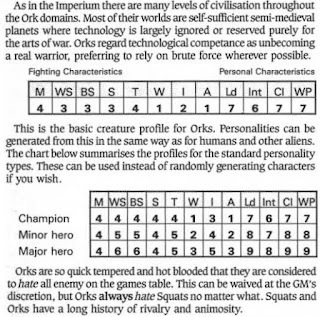 It's not that long ago that I would have balked at the thought of using greenstuff in a conversion like this. So, small steps, but progress is being made. Here you can see the 'floating' ammo pack or whatever. That's gone now. The fuel tanks for the flamer are made from a set of IG binoculars, turned back to front. The 'Comms' style back pack and webbing come from the same plastic IG sets. At one point I had a combat blade from the RTB01 sprue on his left thigh, but took it off as it was one accessory too far and he looked like he might go buckaroo on me. I was really keen to start getting some paint on this mean mother sucker, and was relatively happy with the Blue-grey base colour, but then I got ill, and my painting suffered. So I stopped. You can see his aerial is slightly on the wonk. It is going to need a better fix unfortunately. I might need to pin it but it is going to be fiddly seeing how small the piece is. The scarring I did at the beginning has not really come through very well. This photo also shows up the hideous resculpted arm. Gah! Now though! I'm hoping I've got my hobby mojo back and this chap is number one on my to do list! Thanks for looking! Do check out the original post for the rules and then drop me a comment below or via fb if you are interested in taking part!